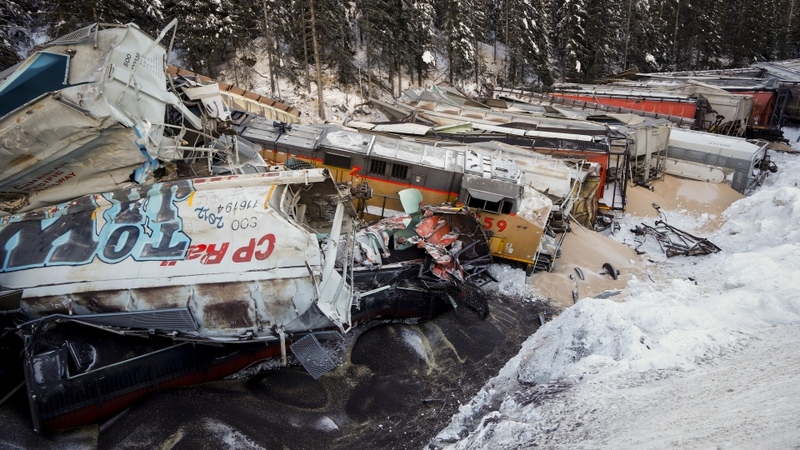 CALGARY -- A Canadian Pacific freight train parked on a frigid night in the Rocky Mountains began to move on its own before a derailment that killed three workers and sent 99 grain cars and two locomotives hurling off the track. 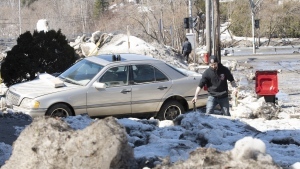 "It was not anything the crew did," senior investigator James Carmichael said Tuesday. "The train started to move on its own." "The lead locomotive came to rest on its side in a creek and a number of derailed cars came to rest on an embankment," said Carmichael. "The remaining cars, including the mid-train remote locomotive, piled up behind." "This territory's among the most challenging railway territory in North America," said Carmichael. "Investigators and others are working hard under challenging circumstances to fully understand what went so terribly wrong." Meanwhile, CP crews, contractors and agencies are working to remove the damaged rail cars and equipment, the company said in a statement Tuesday evening. The work is expected to last "a number of days." "We continue to mourn the loss of our three CP family members," said president and CEO Keith Creel. "I spent the day at the derailment site yesterday, and I have not stopped thinking about this incident since it occurred." A GoFundMe site to help Paradis's family said he is survived by his wife and two young daughters. "He was kind, hilarious, hard working, easy going, and IN LOVE with his family. They were everything to him," said the page set up by Marie Armstrong. Waldenberger-Bulmer's twin brother Jeremy -- also a CP Rail conductor -- said it feels like half of him is gone. He said his family is feeling an "emptiness in our home that is indescribable." "He was loving it and knew he would make a lifetime career out of it. We had big plans of living out our careers with CP Rail and retiring together to golf all over the world. He and I would go golfing any chance we got in the summer. That was our thing to do." But there's a big difference, he said, in that no one was on board when the Lac-Megantic train derailed, killing 47 people in the town. The Transportation Safety Board concluded not enough handbrakes were applied. Chow noted that the transportation board said the crew in B.C. was not responsible for the train starting to move. As soon as it began rolling, the crew would have tried to stop it, Chow suggested, so it's possible the air brakes failed. "It's either process or equipment or behaviour," he said. "If the processes were done right and the behaviour was right, it has to be the equipment. ... Something must have failed to allow the train to go down that hill."